For those who have sailed, and those that wish to, we are pleased to provide the following virtual tours of tall ships. The S.A.L.T.S. ships were photographed in the spring of 2003 and we hope to have more tall ships to add to this collection soon. Built by S.A.L.T.S. 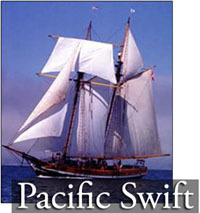 as a working exhibit at Expo 86 in Vancouver, British Columbia, the Pacific Swift has sailed over 100,000 deep-sea miles on training voyages for young trainees. Her offshore travels have taken her to Australia and Europe, to remote communities on Easter and Pitcairn Islands, and to many other unusual and far-flung ports of call. When not offshore, the Swift provides sail training programs along the coast of British Columbia. These include shorter school programs in the spring and fall and 10-day summer trips open to anyone aged 13 to 25. Built by S.A.L.T.S. 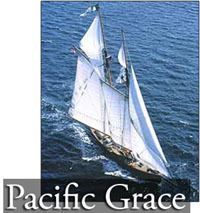 at their shipyard in Victoria, British Columbia, the Pacific Grace slipped her lines May 31, 2001 to embark on her maiden voyage. Currently she is nearing the completion of her second successful season providing sail training programs along the coast of British Columbia. These include shorter school programs in the spring and fall and ten-day summer trips open to anyone aged 13 through 25. 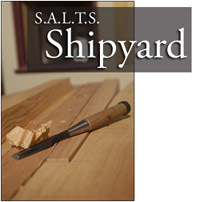 Over 1,000 trainees per year per vessel participate in S.A.L.T.S. life-changing sail training programs. We are working to document as many other vessels as possible using virtual tours. 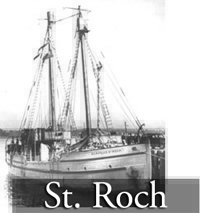 The St. Roch was the first ship to successfully transit the Northwest Passage from west to east and the first to ship to circumnavigate the North American continent. Today she rests stately and quietly in permanent dry dock at the Vancouver Maritime Museum. It is a fitting-resting place, for this is her home, the place where she was built in 1928. Designed as an arctic supply and patrol vessel for the Royal Canadian Mounted Police, she was constructed of thick Douglas fir, sheathed on the outside with one of the hardest woods known, Australian "iron bark." Her interior hull is reinforced with heavy beams to withstand ice pressure. She was originally rigged as a 31.7-meter schooner with a 7.6-meter beam, with an auxiliary 112 kW diesel engine. In 1944, an extensive refit in Halifax gave her a much larger and improved deckhouse and a stronger 224 kW engine. Her masts and rigging were altered to that of a ketch. If you are lucky enough to visit the museum, this is the current arrangement you will see. In 1965 Dr Jacques Piccard met with Marc Bailley-Cowell, a representative of Grumman Aerospace Corporation. At that time Grumman made private and military airplanes and was working on the lunar module for the Apollo missions but they were interested in diversifying into building submarines. An agreement was struck between Piccard and Grumman to build a Mesoscaph (a submersible which could operate in the intermediate depths) primarily for the exploration of the Gulf Stream. This project was called PX-15, which would later be known as Ben Franklin. Owned by the Government of Nova Scotia, Bluenose II has become a national symbol for Canada's east coast maritime history. A replica of the Grand Banks schooner Bluenose, that was well known for defeating most rivals in the early days of the Americas Cup. 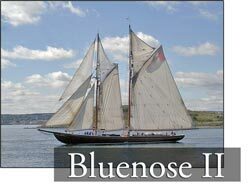 The Bluenose II was launched in 1963 and is still based in Nova Scotia (Lunenburg and Halifax). The Joint Rescue Co-ordination Centre operates 24 hours a day, seven days a week to co-ordinate maritime and aeronautical search and rescue in British Columbia and the Yukon. The Joint Rescue Co-ordination Centre Victoria is one of three Canadian JRCCs; the others are located in Trenton, Ontario and Halifax, Nova Scotia. The Centre co-ordinates the Search and Rescue (SAR) response to aeronautical and maritime incidents within Canada and adjacent waters. S.A.L.T.S. is ever restoring and repairing both their own, and now others' vessels. Take a peek inside their historic shipyard and see the works in progress. We will try to add to these tours from time to time such that the current projects at the shipyard are shown.